Shortly after being dismissed by the Bulls earlier this season, Fred Hoiberg told ESPN that he’d be focused on finding a coaching job, rather than seeking a front office position, when he resumes his career. However, Hoiberg’s stance on his next job has softened a little recently, as Travis Hines of The Ames Tribune details. While Hoiberg said he appreciated the opportunity to spend time with his family this year, he admitted that he misses the “grind” of coaching, adding that he’d be open to a college head coaching position as well, despite his distaste for the recruiting process. Earlier this week, Scott Eden of ESPN.com published a fascinating piece laying out how former NBA referee Tim Donaghy conspired to fix NBA games. The NBA pushed back against that narrative, however, arguing today in an official response that Eden’s story “adds little to the existing record” and contending that much of the new material in the report is inaccurate or misleading. The Knicks weren’t the only team whose deadline moves impacted their summer cap projections. Danny Leroux of The Athletic takes a look at several of the clubs whose offseason outlook was affected by this month’s trades. Back in the fall, the NBA G League announced it would offer a handful of “select contracts,” worth $125K, to elite prospects coming out of high school. Adam Johnson of 2 Ways & 10 Days explores how those contracts might work, and how those players might be assigned to G League teams. The NBA has announced the participants for the Three-Point Shootout, Skills Challenge, and Slam Dunk Contest set to take place the night before the 2019 NBA All-Star Game in Charlotte on Feb. 16. The Three-Point Shootout will include defending champion Devin Booker (Suns), Khris Middleton (Bucks), Stephen Curry (Warriors), Kemba Walker (Hornets), Damian Lillard (Trail Blazers), Dirk Nowitzki (Mavericks), Danny Green (Raptors), Seth Curry (Trail Blazers), Joe Harris (Nets) and Buddy Hield (Kings). Nowitzki, in what may be his final season, will be a key participant to watch, as will the brother duo of Seth and Steph and the local favorite Walker. In the Skills Challenge, the contestants include Mike Conley (Grizzlies), Luka Doncic (Mavericks), Jayson Tatum (Celtics), Trae Young (Hawks), De’Aaron Fox (Kings), Nikola Jokic (Nuggets), Kyle Kuzma (Lakers) and Nikola Vucevic (Magic). Finally, the Dunk Contest features Dennis Smith Jr. (Knicks), Miles Bridges (Hornets), John Collins (Hawks) and Hamidou Diallo (Thunder). Smith, fresh off a trade to New York, is the lone returning contestant as he was eliminated in the first round of the 2018 Dunk Contest. Diallo replaced the injured Derrick Jones. Nets guard D’Angelo Russell has been added to the 2019 All-Star Game by the NBA, the league announced today in a press release. Russell will take the place of injured Pacers guard Victor Oladipo on the roster. It’s the first All-Star selection for Russell, who has enjoyed a breakout season in his second year in Brooklyn. The former second overall pick is averaging career-best marks in PPG (19.6), APG (6.4), FG% (.438), 3PT% (.374), and a number of other categories, en route to leading the Nets to a 28-25 record. That mark puts the team comfortably in the No. 6 spot in the East. Russell was viewed as one of the East’s top snubs when the All-Star reserves were announced on Thursday, and it seemed to be just a matter of time until he replaced Oladipo on the roster. The Pacers guard is sidelined for the rest of the season with a ruptured quad tendon. You can check out the rest of the 2019 All-Star reserves right here. A pair of NBA veterans will make one last All-Star appearance before retirement, as the league announced today that Dirk Nowitzki and Dwyane Wade will be “special team roster additions” for the February 17 game. Nowitzki and Wade won’t be part of the regular draft when LeBron James and Giannis Antetokounmpo choose up sides on February 7. They will be selected in a third round that allows each team to add a 13th player. The remaining eight starters as chosen by the fans will be taken in the first round, with the reserves going in the second round. This will be the 14th All-Star appearance for Nowitzki, who is in his 21st NBA season, all with the Mavericks. He is the seventh-leading scorer in league history with 31,275 points, has made 12 All-NBA teams and has won both an MVP and Finals MVP award. He hasn’t announced his retirement plans, but there is speculation that this will be his final season. Wade, who is conducting his “Last Dance” tour around the league, will be headed to the game for the 13th time. He was named All-Star MVP in 2010 and put together a triple-double in 2012. He has won three NBA titles and an Olympic gold medal and was named MVP of the 2006 Finals. 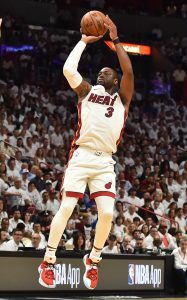 Wade was an eight-time selection to the All-NBA team and made three appearances on the All-Defensive Team. He is the Heat’s career leader in points, assists, steals, field goals made, free throws made and games played. The NBA announced today the reserves for the 2019 All-Star Game, releasing the pool of players eligible to be drafted by captains LeBron James and Giannis Antetokounmpo for the contest. For the Eastern Conference, Washington’s Bradley Beal, Detroit’s Blake Griffin, Toronto’s Kyle Lowry, Philadelphia’s Ben Simmons, Milwaukee’s Khris Middleton and Orlando’s Nikola Vucevic were all selected. Indiana guard Victor Oladipo was also chosen, but he’ll miss the game due to injury. The NBA could name a replacement for Oladipo, with Eric Bledsoe or D’Angelo Russell among the most likely candidates. New Orleans’ Anthony Davis, Oklahoma City’s Russell Westbrook, Denver’s Nikola Jokic, Golden State’s Klay Thompson, Portland’s Damian Lillard, San Antonio’s LaMarcus Aldridge and Minnesota’s Karl-Anthony Towns were chosen to represent the Western Conference. James and Antetokounmpo will draft their respective teams next Thursday, Feb. 7 at 7:00pm ET. The draft will air on TNT and commence just hours after the NBA’s trade deadline. Each captain must first finish selecting from the pool of starters — announced last week — before choosing from this list of reserves. The All-Star Game is set to take place on Sunday, Feb. 17 at Spectrum Center in Charlotte. The starters for the game were chosen by votes from fans, players and media, while the reserves were selected by the 30 NBA head coaches. The NBA announced the starters and captains for the 2019 All-Star Game on Thursday, with the Lakers’ LeBron James and Bucks’ Giannis Antetokounmpo being named team captains for their respective conferences. The Western Conference starters are comprised of James, Warriors stars Stephen Curry and Kevin Durant, Rockets guard James Harden, and Thunder forward Paul George. Antetokounmpo, Hornets guard Kemba Walker, Celtics guard Kyrie Irving, Raptors forward Kawhi Leonard, and Sixers center Joel Embiid were named starters in the Eastern Conference. James (4,620,809 votes) and Antetokounmpo (4,375,747 votes) received the most fan votes from each conference in the past month, giving them the honors of being captains this season. James and Antetokounmpo will draft their teams from the list of these starters and reserves on Thursday, February 7, hours after the NBA’s trade deadline. The All-Star Game will take place on Sunday, February 17, with the reserve players set to be announced next Thursday night. We made our All-Star picks for the Western Conference and Eastern Conference earlier this week. Slotting Harden and Curry into the guard spots is easy. Figuring out who should start in the frontcourt is an immensely difficult task. Davis has done everything for the Pelicans and no player is responsible for a higher percentage of his team’s wins. Durant is averaging 28.0 points per game while shooting 51.1% from the field and dishing out a career-high 6.0 assists per game. Paul George is proving he belongs among the league’s best, averaging 27.0 points and putting himself in position to win the Defensive Player of the Year award. Jokic’s team had the best record in the west for a large part of the season. Harden and Russell Westbrook are the only players in the conference averaging more assists per game than Jokic and he’s in the top five in VORP, plus/minus, PER, and NBA Math’s TPA. LeBron James missing the cut for the starters comes down to him missing a portion of the season to film Space Jam 2 to nurse a groin injury and the ridiculous level of competition alongside him in the Western Conference frontcourt ranks. LBJ and George would likely be starters in other years and you could argue that either would be starting if the league simply picked the 10 best players this season rather than having the East-West distinction. A brief backstory: Shortly after the 2016 NBA Finals, I engaged in a debate with a friend over Steven Adams‘ future in the league. Adams had just had a nice series against the Warriors and overall, He had an encouraging playoff run. Adams is unlikely to make this year’s game, even with a boost in fan voting as a result of his anime connection, but he deserves consideration, which is a sentence I never thought I’d write. He’s hit career highs in a slew of traditional categories and he’s among the top 10 in the West in win shares. However, if Adams is ever going to make an All-Star game, he’ll likely need things to break right (injuries, talent migration into the east, being a key part of a No. 1 seed that completely exceeds expectations akin to the 2014/15 60-win Atlanta Hawks) or he’ll need to be traded to the East. There’s just too much frontcourt talent in the Western Conference. As for who should make it, LeBron, George, and Karl-Anthony Towns are no-brainers. Damian Lillard will make his fourth All-Star appearance while Rudy Gobert should expect his first nod, as he’s leading the league in field goal percentage and essentially every advanced defensive statistical category. LaMarcus Aldridge was in a funk during the first quarter of the season but he’s caught fire since Thanksgiving, scoring 22.7 points and shooting 57.0% from the field since the last week in November. He and DeMar DeRozan deserve credit for their part in keeping the Spurs in the playoff picture. Can the Pelicans get two All-Stars while residing in the conference’s 12th spot? I can’t support it despite how important Jrue Holiday has been to New Orleans. Luka Doncic should win the Rookie of the Year but he doesn’t deserve to be an All-Star. Yes, he has exceeded expectations for Dallas, but he’s shooting a ho-hum 35,6% from behind the arc and 42.8% from the field overall for a team that only has the depressing Grizzlies and inexperienced Suns behind them in the conference standings. Each player made the All-Star game during those seasons and Harris warrants an invitation to this year’s event. Lastly, Russell Westbrook is leading the league in assists. He’s scoring 21.8 points per game but he’s making just 41.6% of his shots, including 24.2% from 3-point range. He’s coughing up 3.5 turnovers per contest and is making just 65.5% of his six free throw attempts per contest. Westbrook led the league in total missed shots in each of the past two seasons and somehow, he’s become even less efficient this year. The 30-year-old will likely make his eighth All-Star appearance next month but I wouldn’t bet on him making too many more beyond this season unless he figures out how to increase his efficiency and reduces the turnovers. Do you agree with the selections above? Are there any changes you would make to the list? What 12 players would you vote into this year’s All-Star game? Let us know your thoughts in the comment section below. We look forward to hearing what you have to say! Images courtesy of USA Today Sports Images. All-Star weekend is approaching and it’s time to dish out votes for each of the 24 spots. We’ll examine the Eastern Conference today, but be sure to check back later in the week for the All-Star selections from the Western Conference. Embiid and Antetokounmpo are legit MVP candidates and while Leonard has fallen from that status, the former Spur remains a full notch above any other frontcourt player in the conference. Irving is an easy selection. Bradley Beal has the biggest case to unseat Simmons in the starting lineup. He’s the sole reason the Wizards are in arm’s reach of a playoff spot. Yet, Simmons is simply having a special season. Simmons carries a higher PER (21.1 to 19.3) than Beal. He is responsible for more victories than Beal, according to win shares (5.4 to 3.3), and he bests the 25-year-old shooting guard in nearly all traditional and advanced stats outside of points and three-point shooting. Simmons is shooting 57.6% from the field, an absurd figure for a player who spends so much time on the perimeter and has nothing that resembles a jump shot. Much of his success can be attributed to talent, more so than to a scheme. Zach Lowe of ESPN.com recently detailed how the Warriors are utilizing Draymond Green with the ball in his hands when opposing defenders are allowing him to be all alone on the perimeter. When a defender sinks back, Green will toss the ball to a shooter around the arch and then sprint toward the shooter in order to screen that player’s man. The defender responsible for Green is left scrambling toward the shooter from closer to the paint and it’s too late; the look is clean. Admittedly, the Warriors are on a different level. They are building beach houses while most of the league is negotiating rent. Still, opposing teams are defending Simmons without anything close to the threat of this kind of wizardry. 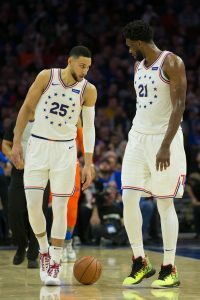 Teams know exactly what Simmons is going to do and most can’t stop it, akin to how opponents are struggling to contain the Greek Freek in Milwaukee. If Giannis is the Mona Lisa, then Simmons is the Vitruvian Man and 22-year-old should have his artistry on display with the starters in Charlotte. Nikola Vucevic is having an outstanding season. He joins Anthony Davis, Karl-Anthony Towns, and Embiid as the only players averaging 20 and 12. He’s one of five players making at least 50% of his shots while averaging at least one block and a 3-pointer made per game. He’s propping up the Magic to appear like a real playoff contender. Vucevic and Beal aren’t the only lead singers who are relying on backup dancers as their squads audition for a playoff spot. The Pistons and Hornets would be bottom-feeders if not for Blake Griffin and Kemba Walker on their respective teams, though both players have had highs and lows this season. The Nets have been great and both Spencer Dinwiddie and D’Angelo Russell deserve consideration for their part in Brooklyn’s feel-good story but neither player makes the cut. I wanted to find a spot for Josh Richardson. He’s been Miami’s most important player, but he’s cooled off during the second quarter of the season. In terms of talent, Jimmy Butler is among the best in the East. However, he’s missed time because of the weeks-long tantrum he threw in Minnesota, the resulting trade period, and the three minor ailments that have caused him to sit since joining the Sixers. Kyle Lowry also missed a chunk of time. Same with Al Horford and Victor Oladipo. Injuries are unfortunate but how many players can be named All-Stars while missing close to 20% of their games? I’m designating one spot to this criteria and Oladipo has been the best of the bunch. (It kills me to leave out Lowry, a Philadelphia-native, but being available to play matters, especially when splitting hairs among quality players). Eric Bledsoe is second on the conference-leading Bucks in win shares. He’s played well as both an isolation player when Milwaukee needed a bucket and within the flow of the offense. On defense, he’s done everything the team has needed and more. Stephen Curry is the only point guard with a higher net rating than Bledsoe this season. My last spot goes to Pascal Siakam. Stability can be valuable – especially with Lowry and Leonard consistently shuffling in and out of the lineup – and the power forward has produced regardless of whoever has been on the court alongside him. Siakam’s improvement since last season is remarkable. He can put on his Draymond Green hat and become a facilitator when needed. 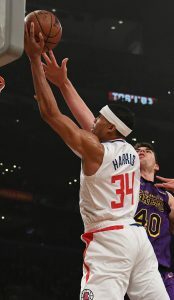 With his smooth lateral movement, he can be an impactful defender on the perimeter and the Raptors don’t skip a beat when teams switch him onto an agile guard. 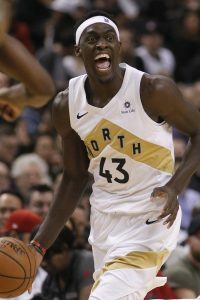 He does all of this in addition to providing solid interior defense and efficient scoring (shooting 57.1% on the year) while playing the most minutes for a legitimate title contender (at 1,490 minutes played, Siakam has played roughly 100 more minutes than anyone else on the Raptors). The advanced metrics match the eye test. He’s in the top 10 in the league in Net Rating among those playing 25 minutes per contest. Only seven players in the Eastern Conference rank higher than Siakam in win shares; Only six rank higher in NBA Math’s Total Points Added metric. Many voters will leave Siakam off their list, as he doesn’t have the track record of other All-Star candidates. He hasn’t proven he can sustain this level of play; he hasn’t put in the time. Regardless of the lack of experience, he’s showcased his worthiness during the first half of the season. With his hustle and grind, his efficiency, and his ability to deliver night after night for the Raptors, he’s proven he deserves to be called an All-Star this season. Do you agree with the selections above? Are there any changes you would make to the list? What 12 players would you vote into this year’s All-Star game? Let us know your thoughts in the comment section below. We look forward to what you have to say! Monday is the last day to submit your votes for 2019’s NBA All-Star starters. Once the fan vote has been closed, the league will also take into account the picks made by players and media members in order to determine this year’s starters. While the All-Star Game itself no longer pits the Western Conference against the Eastern Conference, the selection format still dictates that five starters must come from each conference. Given a somewhat underwhelming crop of star guards in the East this season, that format ensures that Kyrie Irving will likely be joined by one of Ben Simmons, Bradley Beal, or Kemba Walker in the Eastern backcourt. Those players are having strong seasons, but there will be reserves in the Western Conference more deserving of a starting nod. 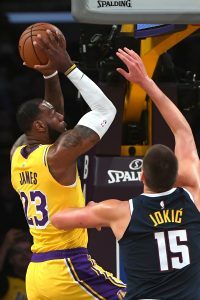 Due to the conference and position restrictions, two players out of the five-man Western frontcourt group of LeBron James, Kevin Durant, Paul George, Nikola Jokic, and Anthony Davis won’t crack the starting lineup. The two frontcourt stars in that group who miss out on starting spots will still end up on the All-Star roster. However, there may be other deserving players who don’t make the cut — even though the rules on positions are less restrictive for the reserves, coaches are still limited to picking seven players in each conference, rather than simply choosing the next 14 best players, regardless of position or conference. As Kevin O’Connor of The Ringer details in a column on his All-Star picks, he spoke to a number of people around the league – including executives, coaches, and reporters – about their own All-Star selections, and all of them admitted that if they were just asked to pick the NBA’s 24 best players, they wouldn’t get to 12 in the East. According to O’Connor, everyone he polled chose between eight and 11 Eastern players in that hypothetical scenario — the most common response was nine, with the other 15 coming from the West. Given how many players around the NBA have All-Star bonuses and incentives in their contracts, the league won’t be able to unilaterally alter the selection format without some pushback from the players. Still, it’s an idea worth considering. If the actual All-Star Game no longer features Eastern Conference players vs. Western Conference players, does it make sense to still require an even number of representatives from each side? And now that we’re in an era of so-called “positionless” basketball, would it make sense to further loosen the restrictions on positions in the selection process? What do you think? Should the All-Star selection format be changed and modernized to better identify the NBA’s 24 best players, or is it fine as is?